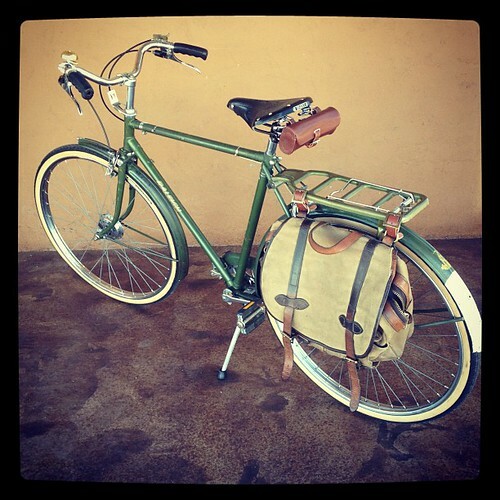 1974 Raleigh Superbe project: new seat, converting Filson field bag to pannier., a photo by ConserVentures on Flickr. I decided to go with a black Brooks B67S saddle (earlier discussion, here). The B66 and B67 were the standard seats that came on the Superbes; after surveying many photos of original Superbes, it looked like both black and brown were common colors. I went with the black because it matches the grips, which are the original grips (which have the Raleigh crest on them), despite a few cracks, and I just have this thing about the grips matching the seat color. I looked for weeks for the right panniers. My initial favorite was the Brooks Brick Lane roll-up pannier set, until I found out it was made in China. I just can't justify the dear price for an off-shore make; I have no problem with the made-in-England Brooks products being expensive (such as the saddle). I wanted the right look for the age and condition of the bike—nothing too shiny, no plastic buckles, no reflector tape, but also not too home-made looking. Duluth Pack in Minnesota makes a nice set, but they were just a little too plain (I know, picky). Then I hit on an idea: I had my old, well-loved Filson Field Bag (large), which attaches easily to the Raleigh rack via the brass D-rings and leather straps. A simple modification to add an attachment at the bottom, and I'll be set with an easy, appropriate bag-pannier for about-town. Visit to BICAS in Tucson, a set on Flickr. Yesterday we visited the community bike shop—more of a combination bike shop, bike salvage yard, community hub, education center, and art studio—called BICAS (Bicycle Inter-Community Art & Salvage). At 12:30 on a hot (105 degrees F) June day the place was hopping already, even though it had only been open for half an hour. You descend a concrete ramp into the cavernous space, which was surprisingly cool. At least 25 people (not counting volunteers and staff) were working on bikes, looking for parts, shopping for a bike, or just browsing, like us. BICAS started in late 1989 as an organization called Bootstraps to Share. A group of like-minded community members came together to assist and empower the homeless population in Tucson, helping folks attain work, shelter, food, and transportation. Over the next few years, the organization focused on sustainable transportation as a requisite for sustainable work, determining their greatest impact was to provide recycled bicycles and the skills needed to maintain them. In that same period, youth became interested in the bicycle mechanics programs. Thus, BICAS in the way we know it today came into existence around 1994, although the name “BICAS” wasn't used until 1996. We have since extended our bicycle recycling, advocacy and education programs out to the entire community. Since our founding, we have trained thousands of youth and adults in the trade of bicycle repair, maintenance and safety, and restored thousands of bicycles, saving them from the waste stream. hundreds of bikes, frames, and parts, very well-organized around the big space. We were surprised by the number of nice classic bikes, from a $350 all-original yellow Schwinn Speedster, to a needs-TLC bronze-colored Royce Union that will fix up into a really lovely bike (I think it was about $150 or less). 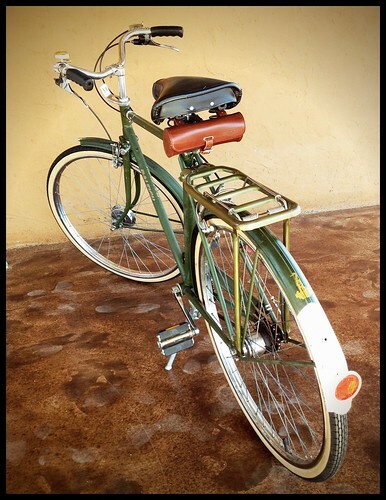 There was also a very interesting 1961 Columbia girls' bike that is a rare "skip-chain." The crank has widely spaced teeth and the chain has wide spaces every other link. We're looking into why this was developed. Certainly interesting! 1972 Raleigh Superbe, a photo by ConserVentures on Flickr. Our 1972 Raleigh Superbe got some TLC today. New tires (Panaracer 26 x 1 3/8 Col de la Vie, from Harris Cyclery), plus a rack, electric tail light (not yet wired), rear reflector and kickstand, all from vintage Superbes, all eBay finds. Also gave the old paint some polishing and wax. Still more to do . . . but it's really starting to shape up the way we envisioned—refurbished, rather than restored, a city bike for exploring favorite towns, shopping, grabbing coffee, or joining Tweed Rides. Next upgrade will be a Brooks 66 or 67 sprung saddle (which came standard on Superbes), though can't decide on the color (black or dark brown?). Although the grips are old and slightly cracked, they are originals and we're loath to replace them. And then some panniers . . . hard to decide. Carridice makes some nice ones. And still looking for an original headlight and pump. I splurged on a new accessory for the Superbe. 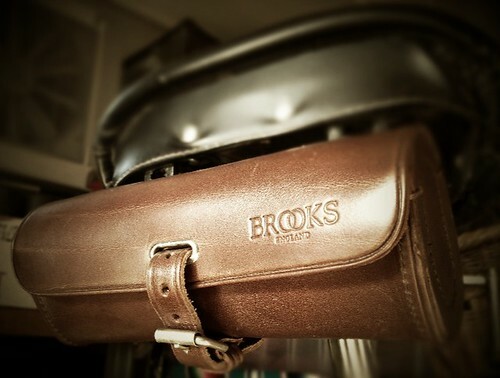 An outrageously expensive gorgeous Brooks leather tool pouch. It does not quite fit the non-stock seat (Superbes came with sprung Brooks B66 saddles). Currently looking for a vintage B66. Two classics, a photo by ConserVentures on Flickr. Spotted at Overland Expo 2012, in use by the staff to get around the grounds. 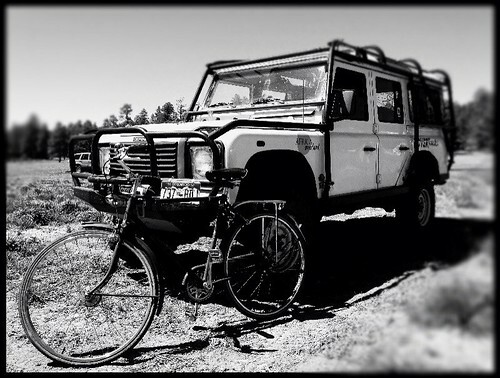 Early 2000s Land Rover Defender 110 and 1972 Raleigh Superbe. We took our 1982 Porsche 911SC out for some exercise Memorial Weekend. The Bisbee Bicycle Brothel is one of the West's best classic bicycle shops, full of beautiful European and American racing, randonneur, and 3-speed bikes and related accessories and ephemera. Ken Wallace, the proprietor, is always willing to share his passion. Call ahead, hours are limited.